In the midst of horror of Andersonville Prison where Union soldiers were kept in a barracaded fenced in piece of land a miracle is said to have taken place. 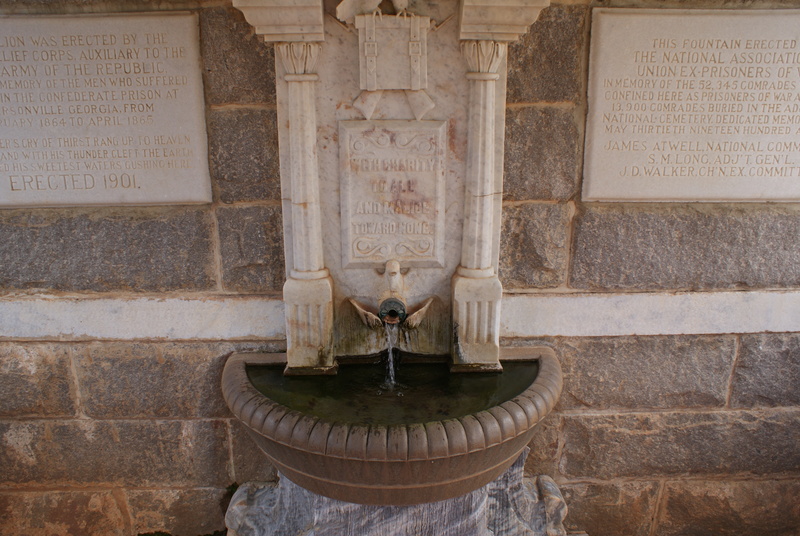 This monument edifies the fountain that bubbled up out of the parched earth when lightening struck creating a spring. The stream that runs through the prison area had been contaminated by the 45,000 prisioners that were packed together. Unsanitary conditions led to the only place to obtain water being unfit. Over 12,000 men died at Andersonville, but on a hot August day in Georgia the story goes that men were praying and a black cloud came overhead and lightening ripped through the cloud and a spring bubbled up from the ground. Today that spring is still flowing and after World War II, a monument was erected. The spring is still cold, still bubbling and offers hope to all that believe God is there even in the darkest of moments. Previous Post: The Quad Cities where art and fun combine. We have visited Andersonville and found it to be so interesting. But, we missed the fountain! We thought the museum was amazing, very powerful and moving. Thanks for the post and renewing a memory.